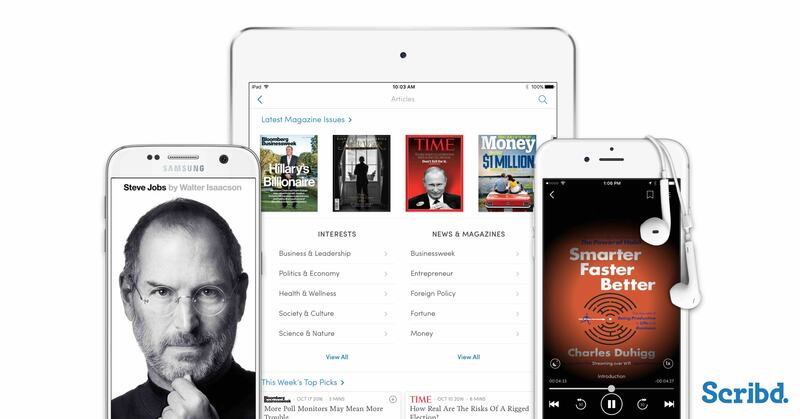 The formerly unlimited reading service known as Scribd sent out a press release today with the news that it now offers magazines in addition to ebooks, audiobooks, and comic books. Subscribers can pay $9 a month for limited access to millions of ebooks, audiobooks, and comic books as well as issues from Time, Money, Fortune, People, Bloomberg Businessweek, Entrepreneur, Foreign Policy, and New York Magazine. Scribd plans to add new magazines on a rolling basis, including issues from Newsweek and The Atlantic in the coming weeks. "We've always envisioned Scribd to be the reading destination that connects readers to the best written work, and magazine articles have been one of our most requested features," said Trip Adler, CEO of Scribd. "By connecting books, audiobooks, documents, and now articles, around areas of interest, our members are now free to skim what's trending or dive deep into any subject." I'm not sure why he's so enthused; this niche is already well-served by the digital magazine subscriptions available through most public libraries,which is enough for most readers. For those who need comprehensive access, there's Texture, a $10 a month service with a selection much larger than Scribd.